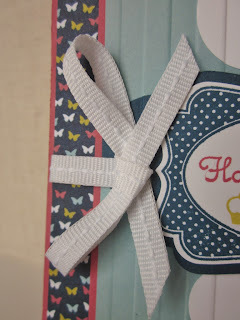 Ribbon Share & Give Away! Hello all! Sorry no post today for the Stampin' Royalty. I took this week off to get back on track. My Artisan projects have been shipped off, and I am busily cleaning my craft room up. Which is a plus for you! My retired products will be ready for sale on June 1st, and let me tell you, there is a TON of stuff, so check back then for the best selection, I will have them priced really good so that they can make their way into YOUR home for some love. Remember this ribbon? I told you that I was going to have a Ribbon Share on this great versatile ribbon. Here are the details, you need to EMAIL ME ASAP to be first on the list for the first round of shares, I will do as many shares as there is interest. Here is the info; one yard of each of the ten colors, each wrapped on one of my special wooden pins. How many shares, and if you would like both shares on one wooden pin, or wrapped separately. How you would like to pay, I will accept Paypal or money order. Per SU policy, I cannot invoice you until June 1st for your payment. BUT you can email me and I will put you on my intended list. As soon as I receive payment (after June 1st) and the share fills up the order will be placed. Keep in mind that I cannot order until June 1st, so the sooner you get email in for your place in line, the sooner you will get your new ribbon. With any new purchase of SU products with me through June 15, you will be entered into my drawing for all of my retired 2010-2012 in-color supplies. This includes cardstock, ink pads, markers, ribbons, accessories, etc. All yours! You can either place your order in my ONLINE STORE or directly with me. If you order online, I do get a notice from SU, so you will be covered. Also, if you order before May 31st, and your purchase is more than $30 pretax/SH, you are also eligible for a free 2012-2013 catalog mailed to you from me! What should you purchase? Well, let me tell you that the Beau Chateau DSP was used on one of my 3D Artisan projects, and you are going to HAVE to have this paper so you can recreate this project. It is simply stunning. Some of the other DSP packs I used are Mocha Morning, and Big Top Birthday. You might just want to pick those up as well because there will be plenty of CASEing going on after I show you the finished projects. Don 't forget to get your favorite stamp sets and accessories before they are gone. Thanks for reading through this whole post, you all are Stars! Have a great day. Wow! I like your Ribbon Share. It is, indeed a great versatile ribbon. I will think about it in purchasing this. Thanks for sharing.